Action for Refugees think that this is a brilliant initiative with potentially great benefits to candidates and the communities they will serve. We wish RefuAid every success with this important programme. Learn how to teach and support young people across the globe affected by violence, conflict or displacement. This free, online course developed by the British Council is designed to help teachers support students who are dealing with trauma. Experienced teachers talk about the challenges, what they have learnt and the strategies they have used when teaching migrant and refugee learners both in countries affected by conflict and in host countries. All teachers and volunteers working with refugees and migrant learners can find ideas and strategies that can be used to better understand learners. The course helps to build inclusive classrooms and develop learners’ confidence, taking into account the languages they know and their cultures. Professor Vicky Duckworth would like to share and celebrate Awor’s inspirational story – reflecting on the power of education to empower those whose voices can often be invisible or / and pathologised in the troubling dominant media discourse. * create a productive place for learning about new areas and sharing materials and resources helpful in work with refugees and displaced people. Visiting from Goldsmiths’ University, last week Dr Julia Hope shared with the faculty her wealth of experience from her PhD research and a decade as a ‘refugee teacher’, working with children from a refugee background in the classroom. 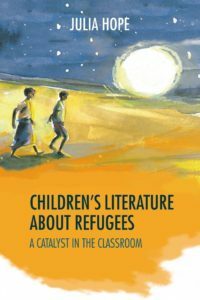 Her paper explored the range of ways in which children’s books can support children with a refugee background to recognise themselves in fiction, as well as the opportunity for children without these experiences to develop empathy and understanding. Her examples demonstrated that even very young children can through discussion and art demonstrate a sophisticated understanding of the reasons people leave, and what it might be like to come to a new classroom, a new school, a new country. Feedback from the session was excellent. One delegate stated, ‘Excellent session – thoroughly enjoyed it. 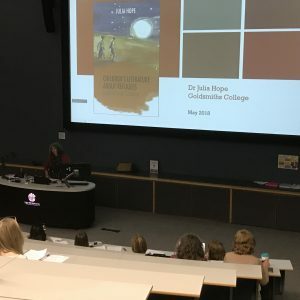 Thankyou!’ Another, who is a trainee teacher commented, ‘We need more talks like this.’ Students and staff plan to read more of the titles Julia included in her presentation, approaching them critically, and seeking to undertake research in the area. Others reflected on the way the session would help in the classroom to work with refugee families and children. The Council of Europe has developed the toolkit presented on this website (available in seven languages) to support member states in their efforts to respond to the challenges posed by unprecedented migration flows. It has been produced as part of the project Linguistic Integration of Adult Migrants (LIAM) of the Council of Europe’s major Programme on language policy. The toolkit is designed to assist organisations, and especially volunteers, providing language support for adult refugees. Throughout the toolkit “refugee” is understood in a broad sense and includes asylum seekers as well as refugees.